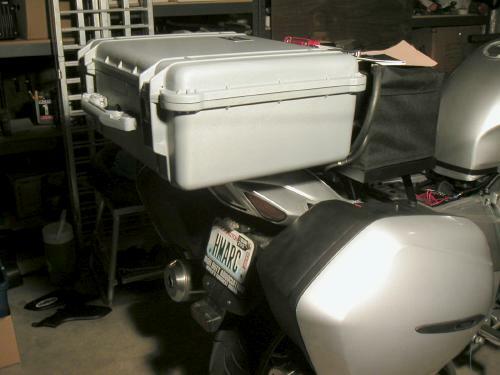 I wanted to mount a Pelican case on my Yamaha FJR1300 as a "top box", primarily to hold my Dell laptop when doing long-distance endurance rides. 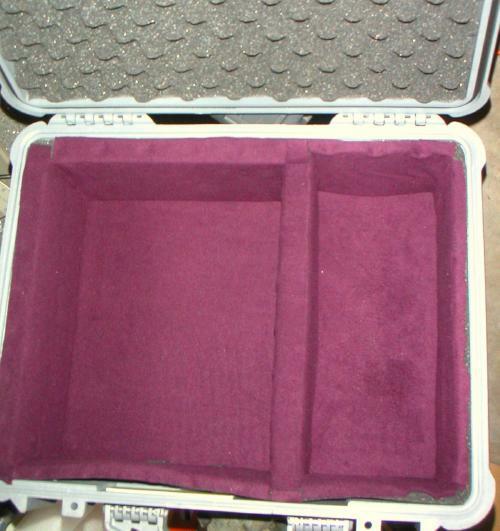 The Pelican case I selected is model 1550 in silver, and it's completely water and dust proof and filled with foam that can be picked out to form the interior shapes necessary. I think I paid about $100 for it, new. Here's what the case looks like inside after I carved out a place for the laptop, and for some other stuff. I bought some felt, and glued it to the foam, just to make it a little nicer. 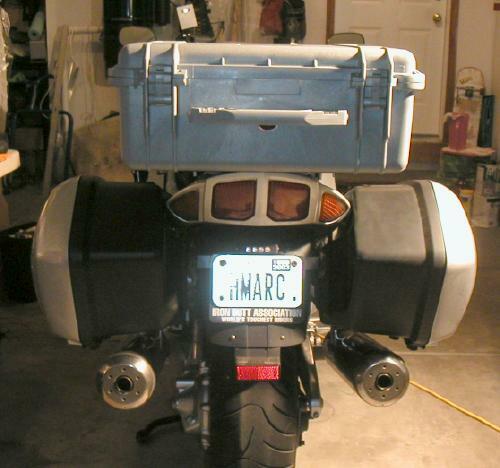 The stock luggage rack didn't lend itself to mounting the Pelican case. 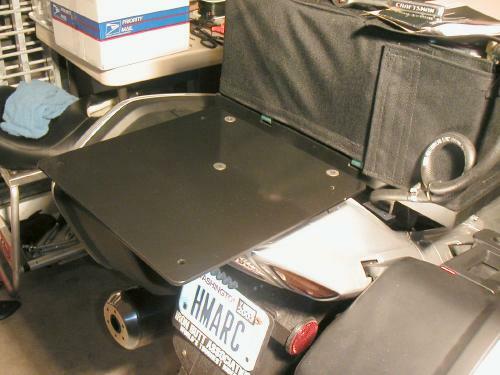 Plus, I have an aux fuel cell mounted (a Top Gun unit from FJRGoodies.com), so positioning was restricted somewhat. I started by removing the stock rack, which is held on by five 8mm bolts. Then I used a friend's milling machine to build the above mounts. The round one is a 1/2" by 1/2" aluminum spacer I bought at Lowes and drilled out to 8mm. The other two mounts I made from aluminum bar stock. The dimensions are approximately: 17.5mm by 22.3mm by 83.6mm. 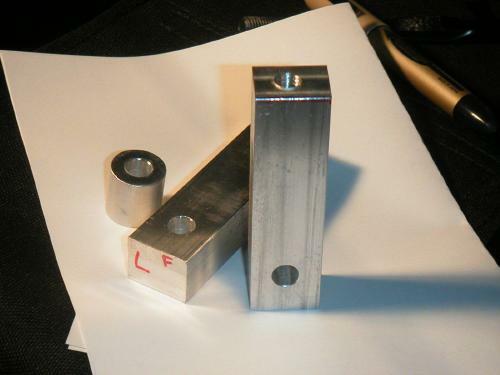 I thought of having the rectangular mounts welded to the plate (see below) but decided to use 8mm countersunk bolts instead, because it was easier for me. 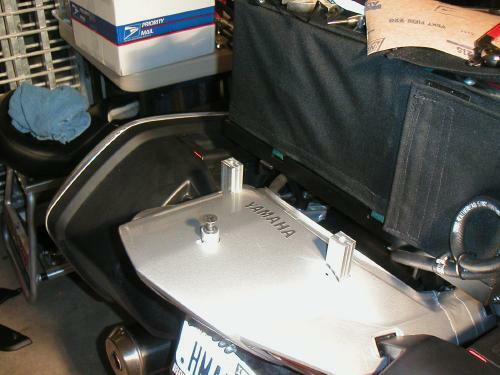 The mounts installed on my FJR. I wanted the flat metal mounting surface to be as low as possible, and as far forward as possible. 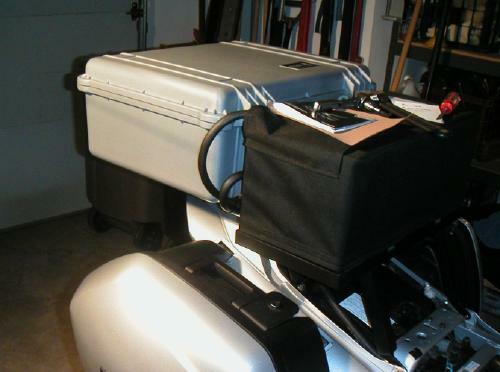 The aux fuel cell, of course prevents the Pelican case from being mounted as far forward as would be ideal. For the mounting surface, I used some fairly thick aluminum, which I had cut to an 11.5" by 11.5" square. I then drilled and countersunk the mounting holes, and painted it gloss black. The final result. I cut some thin aluminum stock into about 2" squares, and put 1" carriage bolts through them, through holes I drilled in the bottom of the Pelican case. I then duct taped them in place from the inside. True, the case isn't really "locked" on the bike, but I didn't want to put the nut ends of the bolts inside the case, due to having to give up valuable packing space. I could still do it that way if the current implementation proves insecure. Or maybe I'll try to find some Torx nuts, so at least it would take a special tool to remove the case from the rack. I figure this case will give me a quick and easy to get to place to keep my rally materials, where they will be waterproof, and can be locked if necessary. I don't plan to carry much in the case, other than the laptop and some paperwork plus perhaps a few other very light, frequently needed items. This photo was taken at a slight angle to the FJR's long axis. The case is actually perfectly aligned over the bike's center line. The latches have provision for adding a padlocks.